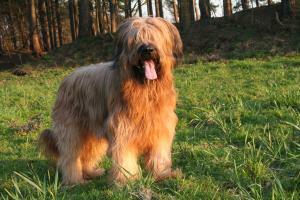 The Briard or ‘Chien Berger de Brie’ is a large, heavy-coated herding dog with a history spanning centuries. Easy to distinguish from other pastoral breeds with similar origins, including its cousin, the Beauceron, the Briard is rugged, striking and has been a popular choice with many a historic figure. Where and when the Briard developed is vague, although there is plenty to suggest its life began in the latter part of the Middle Ages. Tapestries, stone chisellings and folk songs indicate the Briard is a natural descendent of some of the oldest dogs on earth, although it isn’t independently recognised until much later. Historians dispute whether the Briard actually originated from Brie, an ancient region near Paris, or whether the romantic legend of Sir Aubry de Montdidier carries some weight. While it certainly seems implausible that the King would ordain a duel between Briard and man to punish Sir Aubry’s assassin, it makes sense that the dog of Aubry (chien d’Aubry) would eventually become ‘chien de Brie.’ If this is to be believed, the Briard appeared long before 1371 and was already being recognised for its strength and tenacious ability. History attributes the Briard to many famous names, from Charlemagne and Napoleon, to Lafayette and Thomas Jefferson. While Napoleon is credited with owning a number of dogs, including Briards – dogs he raised like his own private army – Jefferson is believed to have introduced the breed to America for the very first time when he imported them to tend his flocks of Merino sheep. The Briard we know today was specifically bred for herding and farm work and was widely utilised across Europe in these important roles. Before the harvest, Briards would chaperone sheep away from the crops and keep them moving on the land, guiding them back to the farm before nightfall. Once their daylight jobs were over, the dogs became watchdogs, protecting against opportunistic thieves and wolves. Not only did such a history develop the keen instincts and skills of the Briard, it afforded it a natural protectiveness and devotion that later translated well in the domestic setting. Today, Briards maintain their strong guarding instincts and their willingness to please, perform and learn and, as such, can sometimes be wary of strangers. The Briard’s most prominent role was in WWI when it was utilised on a large scale on the front-line. Worked in a range of capacities, the Briard quickly gained a reputation as a versatile and trainable service dog, capable of learning quickly and picking up scent trails with ease. Because of this, Briards often accompanied the sentries to look for missing and wounded soldiers. They also ran messages, transported food and ammunition and detected mines. The extent of the Briard's usage during the war meant that the breed was threatened with extinction at its close; it was in fact thanks to the Briard's heroic performance that keen efforts were made to preserve it as much as possible. Returning soldiers spoke of the Briard's fine qualities, not just in combat but as companion dogs that boosted morale and were staunchly loyal to their comrades. - Despite the fact that Briard's have long, shaggy coats, their hair actually sheds very little. That's because the hair's life-cycle is longer and so naturally falls out less often. - A Briard with a pink nose is considered a disqualification of the breed. A black nose is usually insisted upon, regardless of coat colour. - Double dewclaws are fairly unusual, although they are not unique to the Briard. Its cousin, the Beauceron, is also more likely to have dewclaws on both its front and hind legs.